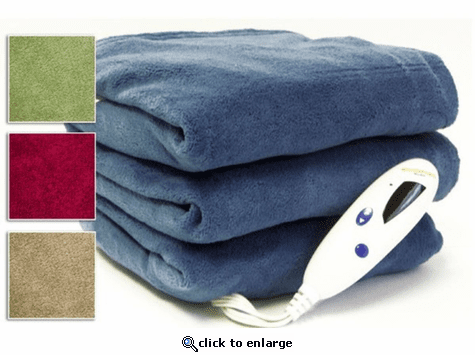 This Heated Blanket is 100% Polyester and comes in Twin, Full, Queen and King sizes and decorative colors. It is Luxuriously cozy and provides therapeutic warmth, with an ultra thin wire for added comfort. Also has digital control(s) with Ten heat settings and a 10 hour auto shut-off for added safety. For ease, this heated Blanket is machine washable, with an extra long 13 foot cord. Skip the winter cold, warm up with your heated throw and enjoy the energy savings as well. Digital 10 setting desktop controller, therapeutic warmth, 100% plush polyester fleece, Energy saving, machine washable, 5 year limited warranty.